Foday Musa Suso is an internationally recognized musician and a Mandingo griot from the West African nation of Gambia. Spread across several West African nations, griots are the oral historians and musicians of the Mandingo people, a living library for the community, providing history, entertainment, and wisdom while playing and singing their songs. The history of empires and kingdoms, tribal conflicts, cultural heroes, and family lineage are all part of a griot’s traditional repertoire. It is an extensive verbal and musical heritage that can only be passed down within a griot family. Foday Musa Suso formed the Mandingo Griot Society in Chicago, and after thirty-two years there he now makes his U.S. home in Seattle. 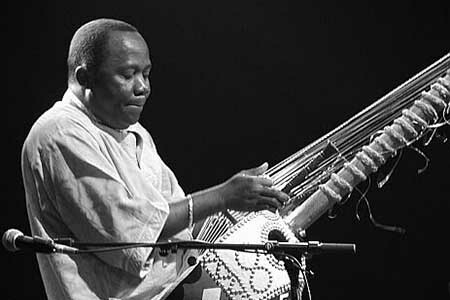 Foday has not only brought the traditional griot music of his homeland to American audiences, but he has brought the kora into more contemporary and experimental settings, collaborating with jazz, rock, and classical musicians as diverse as Herbie Hancock, Bill Laswell, Philip Glass, and the Kronos Quartet. This special concert in the intimate setting of the Chapel will focus on his own solo compositions, drawing on his traditional roots while exploring unusual new directions.